FRISCO, Colo. – Sept. 28, 2014 – When the doors open to ELEVATE coSPACE on Oct. 1, the four female founders believe their new co-working space will, in turn, open doors for others. As Frisco, Colorado’s first coworking space their mission is simple but powerful: Be the place and space to elevate your ideas, work and life. Then there’s the location. Talk about inspiring. Situated at 711 Granite Street just steps away from historic downtown Frisco, Colorado and in the same plaza as Backcountry Brewery, Podium Sports and Abbey’s Coffee Shop, ELEVATE offers 3,000 square feet of space for work and events with log beams, soaring vaulted ceilings, bright natural light, beautiful original artwork in addition to “flex” desks, communal tables, workstations, private offices, conference meeting space and a café-style gathering spot. Centrally located in the hub of Colorado ski country near the ski resorts of Vail, Breckenridge, Copper Mountain and Keystone, ELEVATE offers weekly skiing meetups, educational business sessions, a speaker series with tech leaders, as well as innovative events like Ignite Summit. Coworking is not a new idea, says Wendy Basey, one of the founders of ELEVATE who is also a business consultant and owner of Biz Bolts. “There’s been a boom in the number and type of co-working spaces around the country that allow members and guests to rent a work spot for the day, week, month or year. Now, coworking is moving up to 9,100 feet in the heart of the Colorado Rocky Mountains and offering locals an opportunity to work on their own but not alone. Colorado is becoming known as the place for innovation – not just tech innovation but innovations in policy, design, marketing, small business, tourism and, yes, in technology. ELEVATE recently joined forces with six other mountain coworking spaces to form the Mountain Co-Working Alliance and just announced a new partnership with Rocky Mountain Patent and The Quandary Group based in Denver, Colo.
Wendy Basey: a Colorado Certified Business consultant and owner of Biz Bolts online. Memberships and guest passes for the coworking space are available. Guest passes start at $15 and one-month memberships are $315. Sign up now to reserve your space or to join the newsletter. Visit www.elevatecospace.com/pricing or contact Julia at julia@elevatecospace.com. For more information about the coworking space, please visit www.ELEVATEcoSPACE.com or email hello@elevatecospace.com. Connect on social with ELEVATE coSPACE at @ELEVATEcoSPACE or www.facebook.com/elevatecospace. ELEVATE coSPACE was in the news … again. The first coworking space in Frisco, Colorado was featured in a Sept. 13 story in the Summit Daily News about the new Mountain Coworking Alliance. Recently ELEVATE partnered with six other mountain town coworking spaces to offer reciprocal days for its members. The result? A “season pass” for work that allows skiers to work where they ski and ski at 15+ ski resorts across the country from Jackson Hole to Aspen and from Heavenly to Breckenridge. The Mountain Coworking Alliance was featured in SouthTahoeNow.com this week. The article highlighted the opportunity for skiers and snowboarders to ski and work at seven coworking spaces, including ELEVATE, located at or near the top ski resorts in the country from Jackson Hole to Tahoe to Vail. We, here at ELEVATE, love social media. We believe it’s the core of what we do. it’s all about community, connections and sharing. You see, we’re not just opening a beautifully inspiring, professional coworking space in the heart of Frisco, Colorado. We’re also creating a community and a place for people to share, grow, learn, connect and elevate their lives and work. That’s why we were so excited to connect with some really smart and really digitally savvy marketing pros and business owners in Summit County. We invited them to be part of our ELEVATE your BIZ series to share their insights and social media tips with our community. A huge thanks to Jessie Unruh from GoBreck, Holly Resignolo from Mountain Town Magazine, Jeff Cospolich from Great Western Lodging and Stacy Sanchez from Petal and Bean. It’s also why we were so excited to see so many people show up to our Sept. 10 #coworking meetup to learn, ask questions and share their expertise. There were so many questions that we almost ran out of time. Don’t worry, though, based on the feedback and level of interest, we’ll definitely be hosting another one or two or 10 of these. In the meantime, here’s our top 5 list of social media sins and wins from our roundtable discussion and meetup. If we missed anything, please let us know or add a comment or two or 10. Thanks. – LISTEN. Stacy from Petal and Bean recommends that before you tweet, post or regram, stop and listen. And really get to know your audience, the platform, the way to interact, etc. Jeff from Great Western Lodging encouraged people to monitor keywords and their own industry. It’s also important to pay attention to your competition and others outside of your industry to see what they’re doing and how they’re doing it. – BE VISUAL and tell a story … concisely. That was the advice from Jessie, GoBreck’s social media community manager. It’s important to have stopping power and to quickly tell a story. Visuals allow you to do that effectively and powerfully. Holly from Mtn Town Magazine uses social to promote her brand, create awareness and build loyalty through storytelling. Others – like Stacy – emphasized the need to use social to drive traffic back to their hub – to their website. – DOING TOO MUCH WITHOUT A STRATEGY. Jeff from Great Western Lodging recommends to focus on a few things and do them well vs. trying to do everything. Discipline. Plus, social needs to be part of an overall business and marketing strategy vs. a silo’ed endeavor. – IGNORING your community. It’s important to respond to comments – positive and negative – says our panel. And it’s just as important to pay attention to analytics that show what your audience responds to, when and where. A simple peek at Facebook insights can yield valuable information about the right time to post which makes your social efforts more effective, says Jessie. The social sphere changes every day. And it’s a complex world with many, many different variables. Talk about a moving target. To be successful, you need to have a strategy, a roadmap (an edit calendar or social calendar), a lot of passion and the energy to cultivate relationships with your customers and guests. Exciting news today. 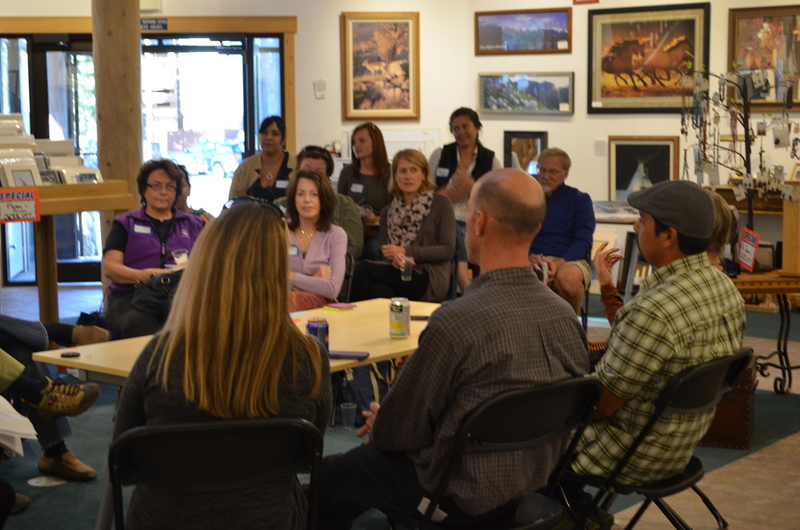 Our friends at Durango Workspace have joined the Mountain Coworking Alliance. We now have seven – 7 – mountain coworking spaces on board for the Alliance. That means even more places to ski and cowork this winter season. Read more. Sept. 2014 – This season skiers and snowboarders can travel to a top-rated ski resort to … work. More than six coworking spaces have opened in mountain towns in the past year from Jackson Hole to Summit County and from Lake Tahoe to Vail. Why? Coworking spaces offer startups, entrepreneurs, business owners, students, corporate workers and vacationers a flexible and affordable place to work and gather in a collaborative environment. The first coworking space in America opened in San Francisco in 2005. Since then, the concept has spread through major cities around the country. Now, the shared workspace movement is moving up to the mountains. “Mountain town coworking spaces are a gathering place for people united by the belief that an inspiring place helps us do our most inspiring work,” says Megan Beck, co-founder of Spark JH in Jackson Hole and vice president of development for Vittana. Tahoe Mill Collective: Photo credit should go to JP Martin. Aug. 2014 – This season skiers and snowboarders can travel to a top-rated ski resort to … work. More than six co-working spaces have opened in mountain towns in the past year from Jackson Hole to Summit County and from Lake Tahoe to Vail.